Instantly access detailed plot status & information or filter and highlight plots by specific criteria. Our online booking system is user friendly, secure and can be installed into the pages of your website. Reduce the cost, effort and time spent by processing transactions with In-Site. It can be used for any kind of transaction including site fees and online booking balance payment. Our searchable, colour-coded chart let's you easily find, add, edit and move bookings between dates and stock. Unique to In-Site, seamlessly links to Sage 50 & 100 so you can pick and choose exactly what records are synced between In-Site and your Sage software. In-Site can be run offline on your local computer or hosted in the cloud - whatever suits your requirements. And if you change your mind at any time, it is possible to migrate your data between the two. We are a family run business based in North Wales and have been developing and refining our highly acclaimed park management software, hand-in-hand with our customers since 1984. Over 400 parks put their trust in us to help their businesses become more profitable and efficient. We know experience that no two park operations are the same and as a result we provide In-Site in different editions for you to choose from. Each edition offers a range of highly configurable tools and can be used with web service add-ons such as online bookings, sales marketplace or payment gateway if required. The complete edition is our most popular editions and gives you all the features and benefits of both bookings and park admin editions. The park admin edition is tailored to residential parks that don't require the holiday booking features of the software. 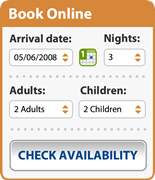 The bookings edition is focussed on holiday booking management and reporting without the residential feature set. Each edition is available as desktop software that you install and manage from your office or a cloud based service that is hosted from our Manchester Data Centre. You are able to switch between desktop and cloud at any point should you wish to and your data can be migrated between them.